Winner of the Grand Jury Prize at Sundance 2012 and the Camera D'or at Cannes, 'Beasts Of The Southern Wild' has been one of the most anticipated films of late. 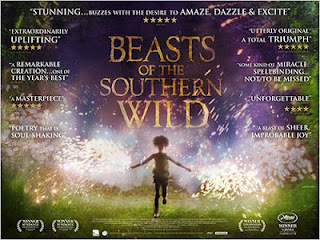 Premiering in the UK at the 2012 London Film Festival, 'Beasts Of The Southern Wild' came away from the festival with its reputation further enhanced, winning director Benh Zeitlin the Sutherland Award for Best Debut Feature. Unfortunately, I was much less impressed. Heavily indebted to the devastating Hurricane Katrina, 'Beasts Of The Southern Wild' is set in an isolated bayou community - the focus is on six year old Hushpuppy ( Quvenzhané Wallis) and her difficult father (Dwight Henry). As a fierce storm hits the community and Wink falls ill, Hushpuppy's optimistic look at the natural world is challenged and she must fight for the survival of her home and preservation of self. I found myself regularly frustrated during the course of the film as the characters' actions continually jeopardise their hopes of surviving their adversity. Indeed, one explosive moment perhaps selfishly jeopardises the lives of many others, making it ever more difficult to sympathise with the plight of the close knit community. The film's frequent flourishes of humour fail to deflect from the central inadequacies, including unnecessary fantasy elements, while the tender moments prove few and far between. There are saving graces in the form of the jaw-dropping production design, and moreover, the emotive score from Zeitlin and collaborator Dan Romer is one of the best of the year. Similarly, the acting from the almost entirely inexperienced cast is naturalistic (performances ably commanded by Zeitlin) and the cinematography reminiscent of Terence Malick's finest. Unfortunately, 'Beasts Of The Southern Wild' falls flat amid its lack of coherance, and quest for sentimentality. 'Beasts Of The Southern Wild' screened at the 56th BFI London Film Festival. The film is out in UK cinemas now, through STUDIOCANAL UK..